If you were born during the month of October - get excited because its your BIRTHDAY! 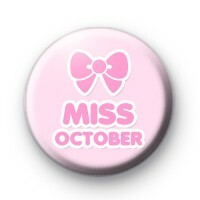 We have this extra special Miss October 1 inch button badge that you can wear all month long. Its a cute soft pink with Miss October written in fun pink bubble font. There is also a pink bow right at the top. Our button badges are a cute handmade gift and everyone needs a badge to wear on their birthday, no matter what age they are.